In engineering/machining terms, honing is used to describe the removal of a small amount of material using abrasive stones. These stones are mounted in an adjustable head specifically designed for the honing operation in question.This honing head is then rotated inside the work- piece while a pressure is exerted on the stones to expand their diameter. At the same time as the honing head is being rotated it is also drawn along the length of the work in a series of continuous strokes.The combination of rotation, stroke and pressure creates a cutting force which removes material from inside the bore being machined. The amount of material being removed can be controlled by adjusting the pressure on the stones in conjunction with the speed of rotation and stroke. Honing stones are available in a variety of grades which can be selected depending on the rate of material removal or surface finish required. In automotive applications, honing is used primarily to improve the surface finish of cylinder bores after reboring or for final sizing of bushes used in areas such as small ends and rocker arms. 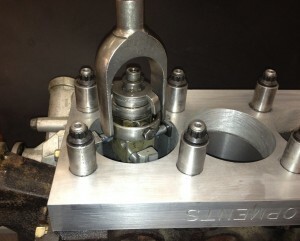 At H T Howard, we also use the honing method to finally finish size our bronze thin wall and replacement valve guides.